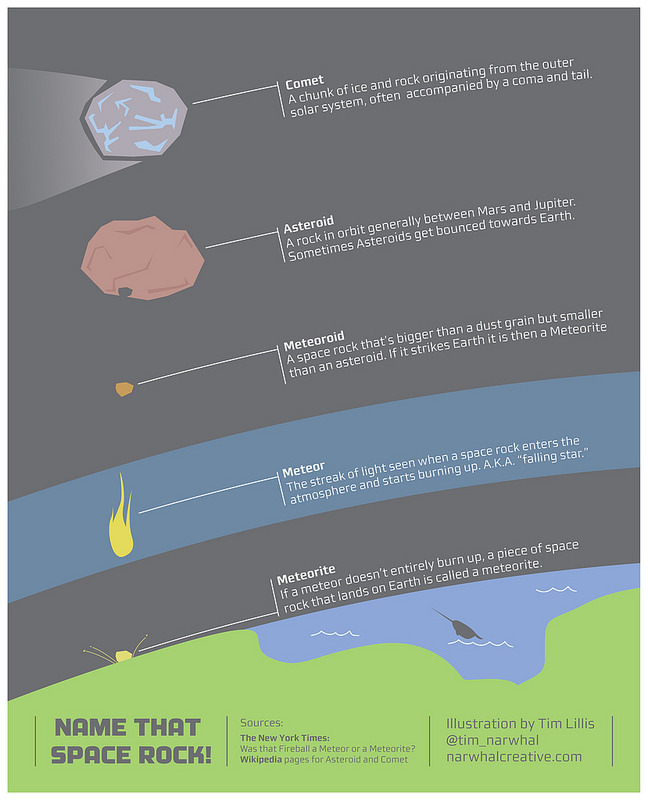 Space rocks need new definitions or classifications… At this moment there is no lower limit for asteroids. It doesn’t seem to me right putting a couple ten meter-wide space rock with a 100 kilometer-wide one in the same basket ! This link should be sent to every main stream media outlet, and every movie producer in Hollywood! So if a meteoroid becomes a meteor then a meteorite, what do asteroids and comets become when they strike the earth? Do they keep their original names, or do they adopt the meteor then a meteorite names? Maybe since they are so large, there would be no one left to name them – so it wouldn’t matter. The term “meteoroid” is poorly defined here. It says a meteoroid is “smaller than an asteroid” and “is smaller than a kilometer.” Actually a 700 or 800 meter object would definitely fall in the “asteroid” category. There have been recent attempts to define a meteoroid as 1-meter or less, but right now there is no clear definition. Soooo, every1 is worried about the names of space rocks in this graphic… but wth is that pointy thing in the water? A sub? with a speed sensor probe like the X15 or some other highspeed x-plane? Have you read that novel THE MYOSHI EFFECT? It’s almost like what just happened, about how people react when an asteroid heads toward earth. It’s based on science, but it’s written in a funny way.